Theodor Herzl once advocated mass Jewish conversion to Christianity, but would become a unifying leader for the Jewish Diaspora. Profoundly concerned about the rise of anti-Semitism, his fears would be dreadfully justified in the years soon following his death. Yet, they provided the early impetus for the Zionist movement that ultimately led to the founding of the State of Israel. His life and mission are documented in Richard Trank’s It is No Dream: The Life of Theodor Herzl (trailer here), which opens this Friday in New York. Herzl believed if a wave anti-Semitic could sweep across France, the cultural capitol of Europe in the 1890’s—and it was—it could happen anywhere. Never particularly religious, covering the Dreyfus Affair as a journalist forced Herzl to take stock of his own Jewish heritage and seriously address the increasing volume of European anti-Semitism. His early ideas proved impractical on further reflection, but the notion of a sovereign Jewish state (not original to Herzl) remained a viable option. 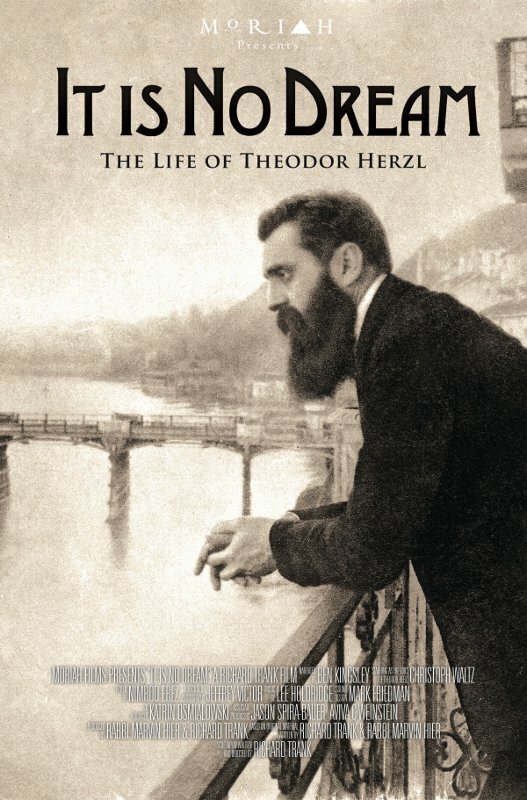 For the remaining years of his life, Herzl became the preeminent leader of the movement forge a Jewish homeland, making his case to some of Europe’s most influential power brokers, including the Kaiser. For Herzl, the only question was where. Eventually, the colonial territory entrusted to England by a League of Nations mandate, known at the time as “Palestine,” became the obvious choice, given the Jewish people’s deep roots to the region. 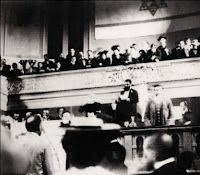 However, Herzl was appalled by the backwardness and poverty of the British Mandate during his first visit. Still, this did not disqualify the small tract of land from consideration. Arguably, it made even more sense on several levels. Produced by Moriah Films, the Simon Wiesenthal Center’s film production subsidiary, Dream is a welcome and necessary antidote to malicious attempts to make “Zionism” a dirty word in the media. Trank and co-writer-co-producer Rabbi Marvin Hier clearly illustrate the alarming nature of anti-Semitism during Herzl’s lifetime, largely leaving unspoken (but ever-present in viewer’s minds) the enormity of the Holocaust, which would tragically vindicate all his fears. Narrated by Academy Award winner Sir Ben Kingsley, with fellow Oscar winner Christoph Waltz giving voice to Herzl’s letters and writings, Dream has a fair amount of star power for a serious historical documentary. With an elegant score composed and conducted by the Emmy winning Lee Holdridge (whose credits including Moonlighting), Dream is a pretty prestigious package, but the real attraction is Herzl’s short but epic life-story, which will probably come as a revelation to many viewers outside the Jewish faith. Though perhaps not the target market, it is those viewers of good will not especially schooled in Jewish history who would get the most out of the film. Consistently fascinating and never dry, Dream tells a compelling story that remains only too timely for the world today. Well paced and informative, It is No Dream is recommended for general audiences, regardless of religion or political affiliation, when it opens this Friday (8/10) in New York at the Quad Cinema.